I have been a fan of Michigan football my entire life. For most of that span, I've enjoyed watching a successful team run onto the field and power past opponent after opponent, although there were some rough years in 2008 through 2014. 2013 and 2014 were notably poor, with the offensive side of the ball often unclear about who it wanted to be and what it wanted to do. Every week during those years, it seemed, the team would show an approach vastly different from the previous one, without much consistency or identity. A favorite Michigan blogger and podcaster of mine, Brian Cook, occasionally referred to this offensive philosophy (or lack thereof) as "The Cheesecake Factory offense." He would explain this phrase by saying, "it's not very good, but there's a lot of it." This metaphor came to mind as I read through Naming the Unnameable: 89 Wonderful and Useful Names for God...Including the Unnameable God by Matthew Fox. 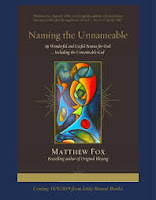 Fox's aim in this short volume, tipped off by the subtitle and further explained in the introduction, is to present a variety of "names" that have been or could be used for God. I place "names" in quotes, because many of these work better as descriptors of how God works in the world or of how one may experience God, to be differentiated from proper titles that faith traditions use and recognize as part of their formal tenets. Only a few of the latter actually make it into the book: Holy Spirit, Mother, Father, Goddess, Kali, Trinity, Holy One, Christ. That's 8 out of 89. The other 81 could be broken down into several categories. The largest, perhaps, are the descriptors I mentioned earlier. Fox explores concepts of God such as Ground of Being, Cause of Wonder, Within of Things, Power of Creation, Destroyer of Darkness and Evil, and so on. Many of these are lifted out of the writing of thinkers such as Thomas Aquinas, Meister Eckhart, and Deepak Chopra. Some of these may be familiar to readers already, and it may be that those already familiar with a faith tradition may nod along in agreement. Another category for some of these "names" may be called those that flatten tradition. These are "names" that hold a nuanced role in a faith and that often are not used to name or describe God, but Fox has lifted out of their role for his own purposes. These include Mary, Kingdom of God, Lady of Guadalupe, Black Madonna, and Gaia. These figures or terms operate within certain traditions in a particular way not meant to be equated with God Godself. They may be people or concepts through which God is experienced, but still distinct from the Divine. Finally, I may categorize a portion of these "names" in life experiences. Fox lists Love, Goodness, Laughter, Music, our Aspirations, Beauty, Truth, and Wisdom. I would not deny that these are all things that emanate from God as gifts to be used, enjoyed, and learned from, as well as conduits through which we experience God's presence. However, as with the previous category, I would not equate these things with God. Most of these entries are a page or two long at most, with great potential to flesh out what Fox means by listing each of them. They may be that short because this is meant to be an introduction to invite further exploration on the part of the reader. However, given the equivalencies that he makes and the flattening of tradition that he undertakes, I'd almost call this approach irresponsible, if not also disrespectful to the traditions he borrows from. That is why the Cheesecake Factory metaphor came to mind as I read. Fox here has tried to undertake a project with too little explanation for much of what he presents. I understand that he wants to show that there are a variety of ways one may relate to or experience God, but there isn't enough follow-up with much of what he shares to really stoke the imagination. In other words, this isn't very good, but there's a lot of it.